The hotel has 138 rooms. The 4-star Danubius Hotel Astoria in the heart of Budapest, built on the site of the medieval town walls, is one of the most charming old-style hotels of Hungary's capital. As the slogan of the hotel goes, Astoria offers "Tradition and style.." with its last turn-of-the-century atmosphere. 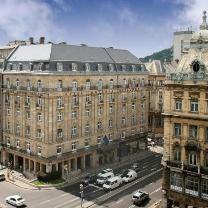 Danubius Hotel Astoria was opened in 1914 after the world-famous Waldorf Astoria in New York. As located in the heart of Budapest Danubius Hotel Astoria has excellent communication to all points of interest within the city and to all international highways. The traditionally furbished rooms offer TV with satellite programmes and pay-tv, minibar, built-in room safe, direct dial telephone, air-condition, WIFI and hair dryer. The enhanced, newly renovated guestrooms offer a rewarding union of timeless elegance, up-to-the-moment convenience and classic sophistication. The air-conditioned rooms' colours, flat ochre, terracotta, and full Burgundian, the textile patterns, the elegant antique-like white furniture of the new room type remind of Provencal atmosphere. The elegant rooms with bigger floor space and insight height containing extra quality amenities can match with all exclusive requirements.